Apex Legends from Respawn Entertainment has taken the battle royale world by storm. With over 2.5 million players on the first day alone, the latest online PvP game seems to have nailed the formula for what fans want in BR. Just like any other game of the same genre, there are tiered items that players can uncover but there are certain items that are really coveted for how they look on the Legends. 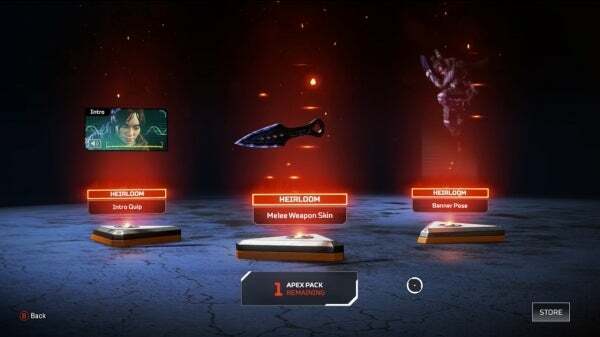 The Heirloom 'Bonus" items aren't easy to get, in fact - there's a 1 in 500 change of obtaining these special items in Apex loot boxes. From skins, to witty one-liners, to rare banners, these cosmetic items certainly are a treat which means they are definitely hard to get. These items also connect some of the dots about the backstory of Apex Legends, which is tied into the Titanfall universe. Sounds pretty cool, right? Unfortunately, they aren't craftable so getting these specific items really is about the luck of the draw. Given that I am super unlucky when it comes to drops, I've already accepted that I probably won't see these bad boys in the foreseeable future. The set you see above is for Wraith, but Respawn did mention that more will be added post-launch to continue on the quest of loot and history. For now, Wraith has got the shiny new gear that players will want so for now, enjoy. Ready to try it out for yourself? Apex Legendsis now available for the PlayStation 4, Xbox One, and PC. Respawn also talked a little bit about cross-play plans and what that means for progress, you can learn more about that right here with our previous coverage. Thoughts on the latest battle royale game? Join in on the conversation in the comment section below, or hit me up over on Twitter @DirtyEffinHippy!